January | 2013 | Related How Again? #104: O Cousin, What Art Thou? 104.2 Dear CD: God’s nightgown, you are so right! And right at the outset, let me say that I will be considering only textual evidence from Margaret Mitchell’s novel…a very long book, most of which couldn’t possibly be included in the movie. Even elements that did make the transition from printed page to silver screen were changed around…like the book says “My dear, I don’t give a damn”…no “frankly.” And germane to this discussion, there is one bit of genealogical evidence completely made up for the movie, which we’ll get to in due course. 104.6 Beatrice really is a hoot, and I have included the continuation of this passage in Wicked Ballsy if you’d care to give it a read. At first blush, it seems open and shut: her opinion is that “cousins” shouldn’t marry. But Ashley and Melanie are 2nd cousins…does the rule still apply to them? According to Mrs. T., it does apply, even to 2nd cousins. And I think it’s safe to assume that this mention of 2nd cousins implies her first mention of “cousins” meant 1st cousins. But later in the discussion, she relates her own experience…that her parents wanted her to marry a 2nd cousin and she would have none of it. So does “even second cousins” refer to Ashley and Melanie…or to her self? I think it can be taken either way…my sense is she means Ashley and Melanie…and so we’ll sketch out the possibilities in Chart 363. 104.7 There is a subtle shift in implication from the book…Wilkeses and Hamiltons always marry their cousins…to the movie…only Wilkeses do. 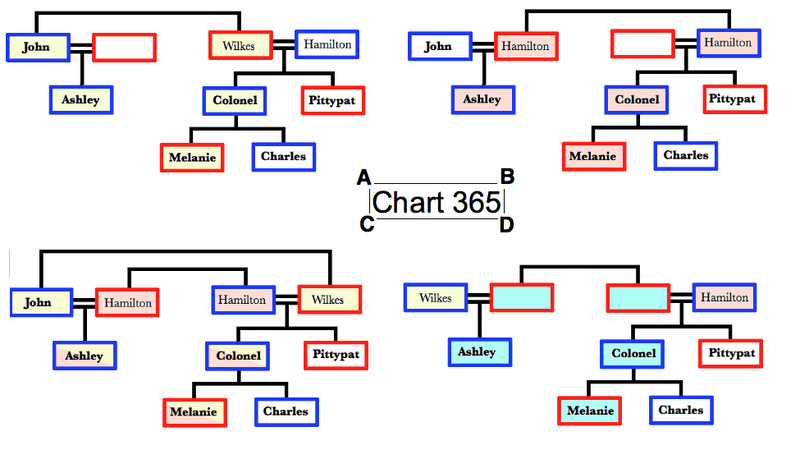 Now I doubt anything significant was meant by this change…but notice that in Chart 363A Ashley and Melanie are Wilkes 2nd cousins…but in 363B they are Hamilton cousins…in 363C they are both (double cousins? yes…wait for it!! )…and in 363D they are neither…their grandfathers married 2 sisters who were, let’s say, Bluebuckles. Perhaps, strictly interpreted, the movie version implies Melanie must be a Wilkes…still, all 4 possibilities equally fit the requirement of cousins marrying cousins. …we give them parents who are a mixed pair of 1st cousins…top, a male and female Wilkes…bottom, a female and male Hamilton. 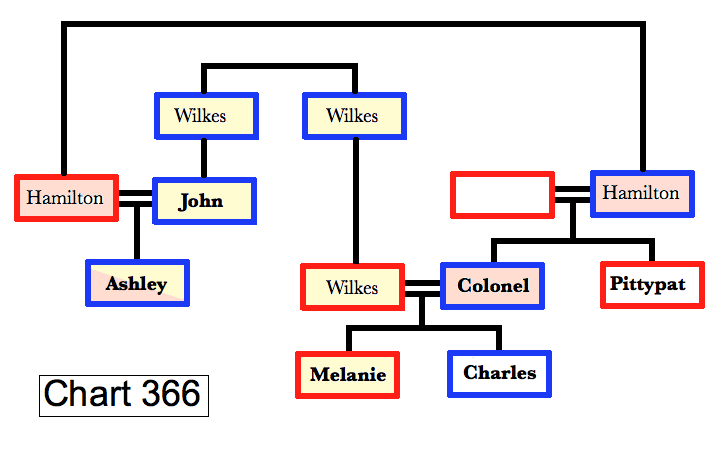 And there’s even another possibility that I didn’t diagram…that John Wilkes and Colonel Hamilton married women who were Bluebuckle 1st cousins, along the lines of Chart 363D. So that’s that? Pick the one you like? Well, no…because there is one very crucial complication. 104.9 This is from Chapter 1 and is the first mention of the Hamilton clan. 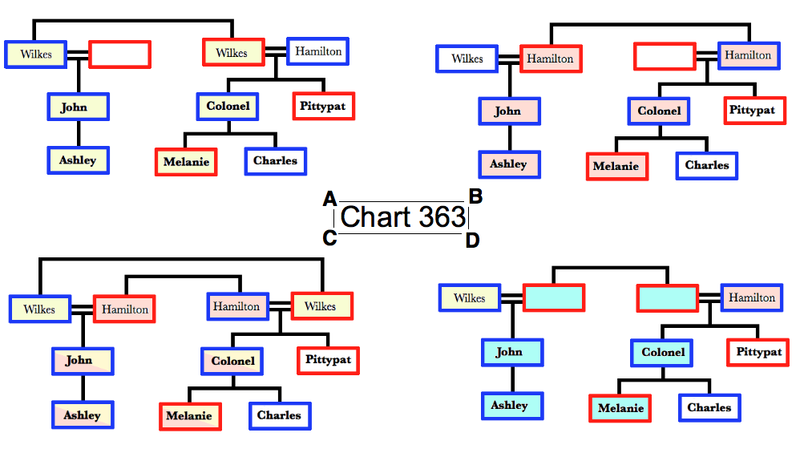 Pittypat is Ashley’s “cousin.” Now the way we drew it in Chart 363…and the bottom part of Chart 364…Pittypat is Ashley’s father’s 1st cousin, or Ashely’s 1st cousin once removed…and in the top of 364, she is so by marriage, not blood. Certainly “cousin” used here could simply be an abbreviation for “cousin once removed.” But could Ashley and Pittypat literally be 1st cousins? 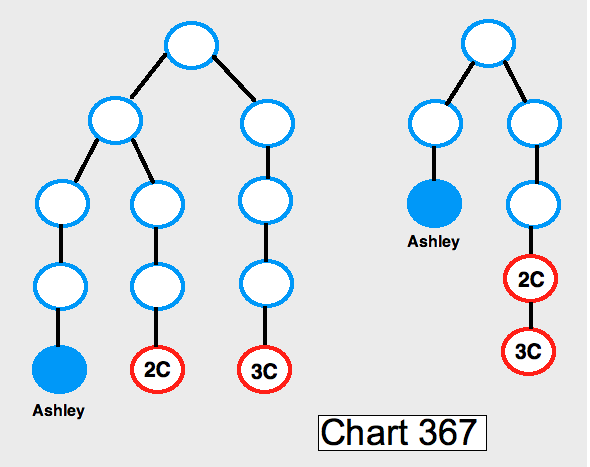 Chart 365, modeled after Chart 364, shows these possibilities…only now, Ashley and Melanie are not longer 2nd cousins, but are instead 1st cousins once removed. 104.10 Personally, my reading of it is they are indeed 2nd cousins…public perceptions, at least reflected by the internet, are mixed…they are called 1st cousins, 2nd cousins, 1st cousins once removed, or just unspecified “cousins”…and some folks even hedge their bets by calling them “distant cousins.” But hey…since everyone has 2 sides to their family, can’t both be true: Ashley is 1st cousin to Pittypat and 2nd cousin to Melanie? 104.11 But of course! 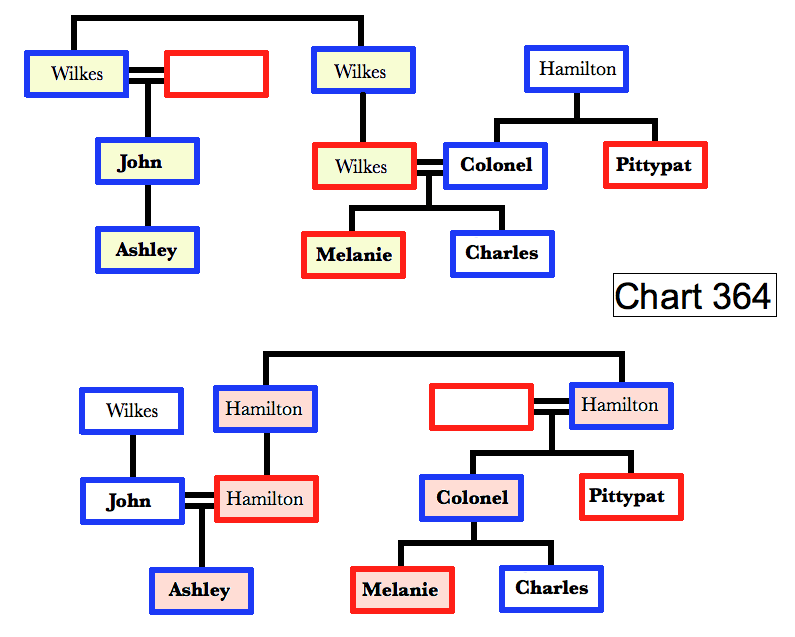 In Chart 366, Ashley is 1st cousin to Pittypat and Colonel Hamilton since their fathers are brothers…they are Hamilton 1st cousins. Ashley is also a Wilkes 2nd cousin to Melanie…his father and her mother are Wilkes 1st cousins. And there’s an added bonus…Ashley and Melanie are also 1st cousins once removed thru the Hamiltons. So taking everything said in the novel literally, I’d say Chart 366 best fills the bill. 104.13 See, the whole point of our system of cousins is that “numbered cousins,” not removed, are of your generation, and presumably in the pool of people you might marry. This is not to say you couldn’t marry someone much older or much younger than you are…or contrarywise, a numbered cousin might be of a significantly different age than you…but in general, this is how the generations shake out. 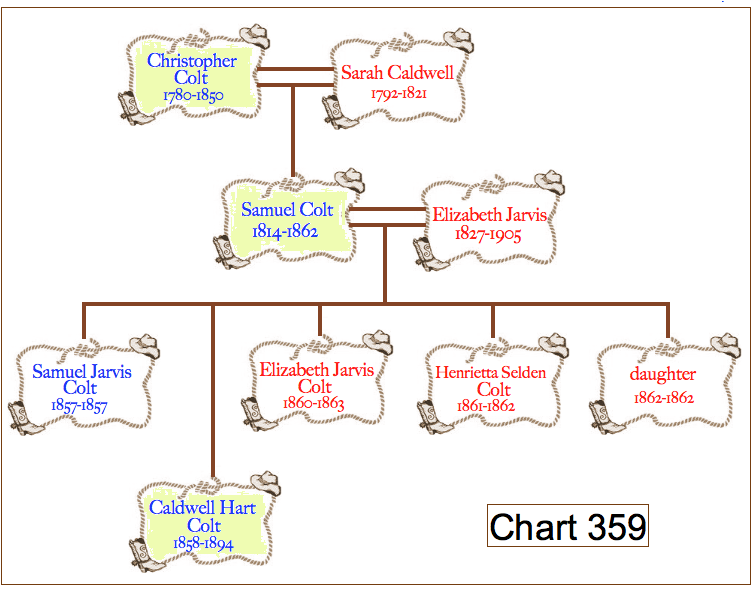 Thus it is reasonable to think that Margaret and her characters are using numbered cousins correctly, as on the left side of Chart 367, not incorrectly, as on the right side. …and didn’t I tell you…double cousins! 104.15 In summary, Ashley Wilkes and Melanie Hamilton are 2nd cousins…notwithstanding the fact that Melanie’s aunt is also Ashley’s 1st cousin. And that’s the definitive answer…well, according to the book! 104.16 And I’ve already said that the book is all that counts. But there is a curious scene in the movie, with dialogue and information that is not found in the book, and I’d like to finish off today by examining it. It’s Christmas time, and Ashley is on leave from the fighting to visit Melanie and Scarlett, who are living with Pittypat in Atlanta. This scene takes place at a Christmas dinner…such a dinner does appear in the book, but the dialogue does not. This is spoken by Pittypat to her coachman and butler Uncle Peter, played by Eddie “Rochester” Anderson. 104.18 Here we see Pittypat’s father has an Uncle, Admiral Will Hamilton, and he marries one Jessica Carroll. Are they 2nd cousins once removed? 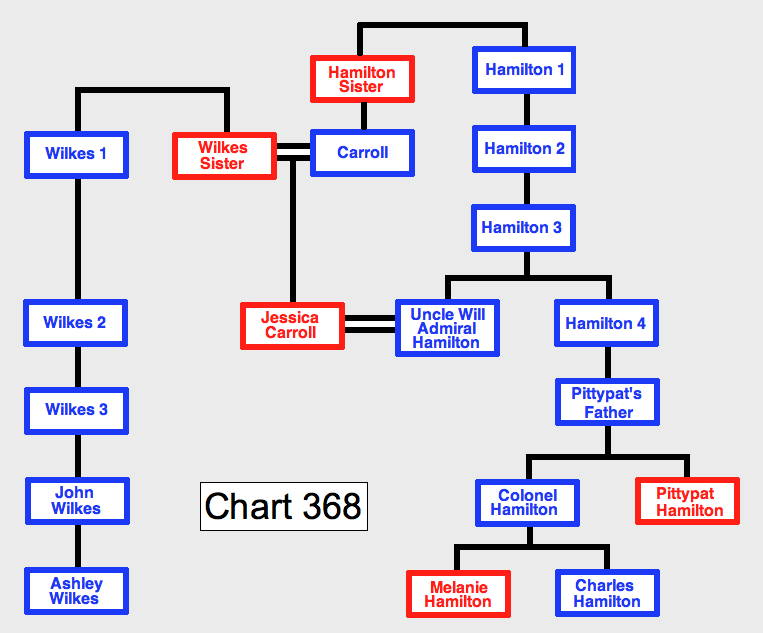 Yes…Hamilton Sister and Hamilton 1 are siblings…Hamilton Sister marries a Mr. Carroll and has a Carroll son, who is 1st cousin to Hamilton 2. Their children, Jessica Carroll and Hamilton 3 are 2nd cousins…and Admiral Will married his father’s 2nd cousin, his own 2nd cousin once removed. That much is set…but now Jessica is also said to be kin to the Wilkeses. One of the easiest ways to do that would be to make her mother a Wilkes…and the great great grand aunt to Ashley thru his father John. “Ah-ah-hum,” said Gerald, suddenly and guiltily aware that the conversation, a most interesting and entirely proper one to him, would seem quite otherwise to Ellen. In fact, he knew she would never recover should she learn that her daughters had been exposed to so frank a conversation. But Mrs. Tarleton was, as usual, deaf to all other ideas when pursuing her favorite topic, breeding, whether it be horses or humans. “Not meaning to change the subject, Ma’m,” broke in Gerald hurriedly, for he had noticed Carreen’s bewildered look and the avid curiosity on Suellen’s face and feared lest they might ask Ellen embarrassing questions which would reveal how inadequate a chaperon he was. Puss, he was glad to notice, appeared to be thinking of other matters as a lady should. 103.4 …what with draconian contracts, cutting corners at every turn, recycling scripts between series, all sorts of dubious business practices, all in the name of saving a buck. Thus, despite their respective series’ popularity, the stars of both Cheyenne and Maverick walked out on their roles…Clint Walker eventually returned, James Garner didn’t. 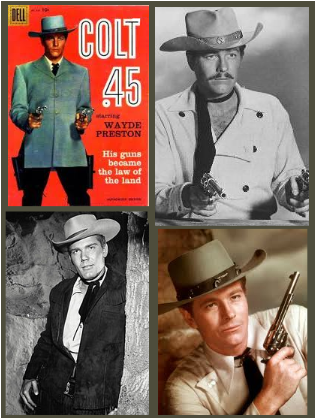 And during the third and final season of Colt .45, Wayde Preston also took a hike…he was replaced by Donald May in the role of Christopher’s cousin “Sam Colt Jr.” That’s him bottom left…the other 3 are Preston, unable to decide about the ‘stache. 103.5 Now “Sam Colt Jr.” doesn’t leave much room for interpretation, does it? The son of Samuel Colt, pure and simple. But again, does this jibe with historical fact? And to place this whole deal chronologically, Chris and Sam were said to be operatives of President Ulysses S. Grant (presaging The Wild, Wild West)…putting the time period between 1869 and 1877. 103.6 As you can see in Chart 359, Samuel Colt did have a son named Samuel, but he died in infancy. 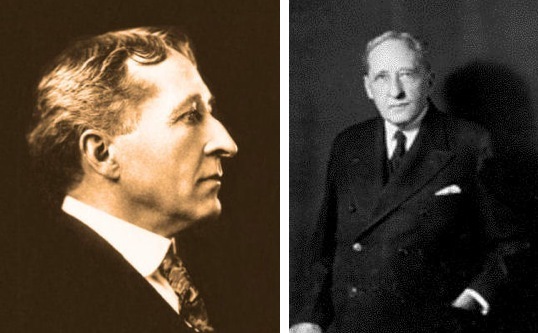 His only child who survived to adulthood was Caldwell Hart Colt…it was hoped that he’d take up the reigns of the family gun business, but he was more of a sportsman…hunting, fishing, yachting…and died of tonsillitis at age 36. 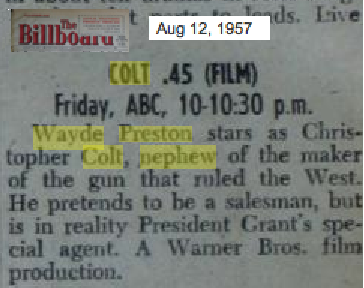 Curiously enough, Samuel Colt’s father was named Christopher, but that doesn’t help either. 103.7 So we move on to Chart 360…Samuel Colt’s brothers and nephews. Here we find 2 more Christophers…Sam’s brother and a nephew. Unfortunately, the nephew died in 1844 at age 2. There are also 2 Sams…one, brother John Caldwell Colt’s son, was rumored to actually have been Samuel’s son…but he was a New England farmer, not a western secret agent.The other, known as “Pom” Colt, was an industrialist and politician in the state of Rhode Island…and he would have been just 16 at the start of the Grant Administration. 103.8 And there you have it…Chris and Sam Jr. were complete fabrications. 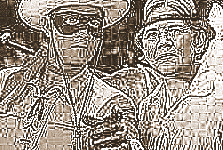 And it’s ironic when you consider that the WB westerns…all of which took place in the same TV “universe,” with numerous crossovers where the characters from one series would pop up on another…included appearances by real historical figures…Billy the Kid, Belle Starr, Buffalo Bill Cody, Doc Holliday, you name it. 103.10 Dear Wilkes: Definitely not crap. As a child, Margaret Mitchell would spend summers at the home of her great grandfather Philip Fitzgerald in Fayetteville, Georgia…and “Rural Home” as the family called it was the inspiration for the famous Tara plantation. Philip’s niece did in fact marry Doc Holiday’s uncle, as you can see in Chart 361. 103.11 You’ll often read that Mitchell and Holiday were “related by marriage.” To many people, that means brother/sister-in-law…but in the wider sense, it can simply mean someone from one family married someone from the other family, and that’s the case here. 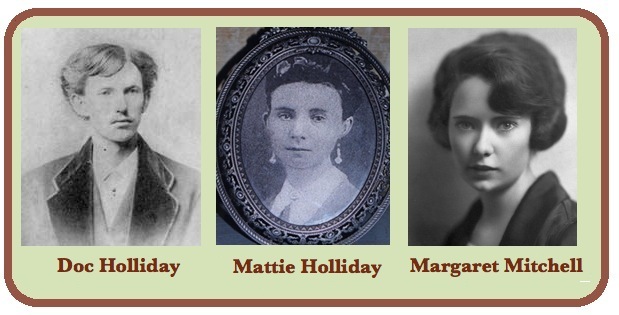 I also came across the statement that they were “2nd cousins by marriage”…altho as shown in Chart 361, the link is Mattie Holliday, who was Doc’s 1st cousin on one side of her family, and Margaret’s mother’s 2nd cousin on the other side…making her Margaret’s 2nd cousin once removed…even so, Margaret is definitely no blood relative to the famous gunfighter. 103.13 …she was a nun, Sister Mary Melanie, having entered the convent 4 years before Doc Holliday’s death in 1887. She worked in a hospital in Atlanta until she eventually went blind and retired to live at Rural Home in Fayetteville, where young Margaret Mitchell came to know her. Now many times, your cousin’s “cousins on the other side” don’t have a lot of significance in your life, but in this case, that cousin was someone famous, and young Margaret loved hearing stories from Sister Melanie about the old days and Doc’s exploits…Margaret Mitchell was born 13 years after Doc Holliday died. 103.15 You know, the Internet Movie Data Base (Imdb) is a truly wonderful resource, but it has its mistakes…I find them all the time. And I believe it is instructive to consider just how loopy your family tree can get when you don’t know what a 2nd cousin is…which is to say, you think it’s just “down one”…your 1st cousin’s child is your 2nd cousin. 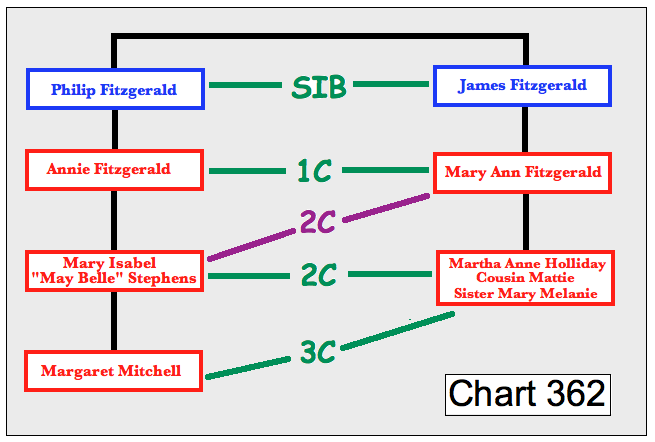 In Chart 362, it is said that Margaret Mitchell and Sister Melanie are 3rd cousins…why? Because Margaret’s mother and Sister Melanie are 2nd cousins. 102.3 …and it all began on August 22, 1908 in Sanford, Colorado when professor of music and voice William King Driggs married Pearl Caroline Mortensen. 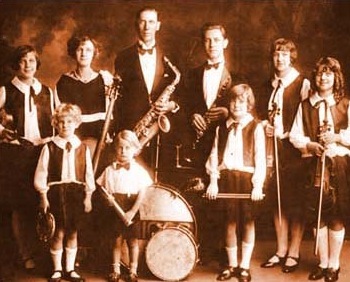 Soon the babies started arriving, ultimately 2 boys and 6 girls…and they were all members of a family band, as seen at right in 1924…youngest sister Marilyn wasn’t born until 1931. They lived in various towns in Colorado and Utah (they were Mormons) and performed as “W. King Driggs and His Family of Entertainers.” Yes, the patriarch of the clan went by the name King Driggs. 102.5 A year later, back in Salt Lake City and singing on the radio, they were told “Driggs Sisters” didn’t sound so wonderful, and what was their father’s first name? “King” came the reply, and that was that. Needless to say, they were a hit, and began performing with big bands, first Horace Heidt then Artie Shaw. Maxine retired, and was replaced by Donna and Yvonne, as they became 4 King Sisters. In the early 1940s they were fronting Alvino Rey’s band…he eventually married Luise in 1945. Donna retired, replaced by baby sister Marilyn in 1953…thus all 6 Driggs sisters were King Sisters at one time or another, first as a trio, then a quartet. 102.6 And as an interesting sidelight, there was actually a 7th King Sister…well, sort of. When Maxine, Luise and Alyce were performing as a trio, younger sisters Donna and Yvonne formed a high school group with their friend Anita Johnston…and all would occasionally appear together as the “Six King Sisters.” To which we should add a kind of 8th King Sister…for a time in 1937, a singer named Peggy Pope formed a trio with Luise and Alyce. And not for nothing, but Alivno Rey’s last name means “king” in Spanish…funny coincidence, nothing more…he was born Alvin McBurney. 102.7 At any rate, the King Sisters quartet backed by Rey’s Orchestra were popular all thru the 1950s and early 1960s. He was famous for his “talking guitar”…check out “Rock Gently,” a very cool track from 1959, featuring his signature pedal steel. 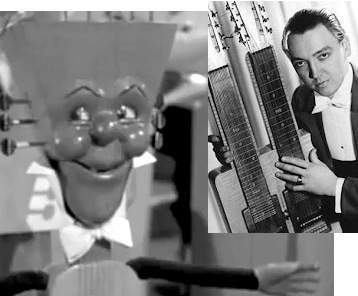 In the 1940s he had used a vocoder (as Peter Frampton would decades later) with wife Luise off-stage “singing” the parts for a guitar puppet named Stringy, but later it was all just playing skill, including wah-wah-ing with the volume control…here’s “Hindustan,” also from 1959…dig those crazy harmonics! 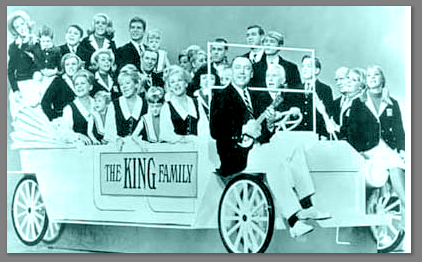 102.9 So to answer your question, I will limit myself to the 1965 program…and our starting point will be the King Family’s official website, which counts the 6 King Sisters, Alvino Rey, who by this time was serving as the musical director for the whole ensemble, and 32 assorted relatives, altho they don’t give the names…that’s a total of 39. Based on a very comprehensive genealogy (here), I have broken down the Driggs siblings into 2 groups: the King Sisters of 1965 as Chart 347…and the other 4 siblings as Chart 348. 102.11 In 1965, they released 2 LPs of songs from the show, plus a Christmas album. 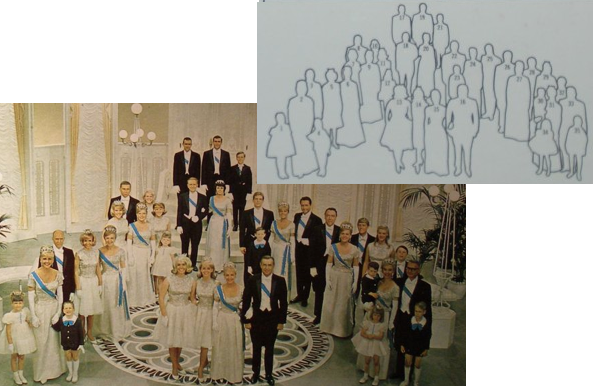 The above family portrait and “key” is from the back on the 1st LP…all members are listed by number and identified by name…said to be “appearing on the show and in this album.” There are 35 in the picture, plus another 5 mentioned who are “not shown.” This includes all 39 in my charts except for Maxine’s daughter (I’m assuming it’s a daughter) Jann Thomas…who turns out to be quite a mystery person, as the internet can turn up neither hide nor hair of her. That’s 38, plus new husbands Robert Wilson for Candy Conkling and Kent Larsen for Marilyn…for a total of 40. 102.12 But there’s one final mystery to untangle, since the number 41 keeps popping up. And there are 2 candidates for that slot…one is patriarch William King Driggs, who did in fact appear on several shows and is pictured in a then current group shot on the back of the 2nd LP. He died on April 6 1965, it is said having suffered a stroke on stage, but carrying on till the number was finished, then collapsing. So he’s your 41st, right? 102.13 No…nothing’s ever that simple…because some sources say the family ranged in ages from “3 to 76 years”…OK, 3 would be Bill Jr.’s son Jonathan…but 76 would be a mistake, since Papa was 79 when he died…he would have been 80 in October. Other sources give the range as from “7 months to 79 years”…well, the 79 is right…and the 7 months would be Candy’s daughter and Donna’s granddaughter Kristen Yvette Wilson, born in May of 1965…who would have 7 months old in December of 1965, just as the show was ending its run. By my cyphering, that gives us 42 in all…well, that’s my number and I’m sticking to it…. 102.14 But wait, I know you’re thinking…what about Mama Pearl Driggs…who BTW had a bit part in the 1959 monster movie “Hideous Sun Demon,” starring and directed by her son-in-law Robert Clarke (left) and also featuring Donna, Xandra, and Del Courtney. She died in 1970 at age 81…imdb says she occasionally joined the family on their show and specials…but she isn’t in the group photo from the first LP…so you could go out on a limb and say 43…me, I’m sticking with 42…and see you next week! One final genealogical note: since “King” is uncommon, altho hardly unheard of, as a given name, you might think William King Driggs got his middle name from the surname of an ancestor…and you’d be wrong, but therein lies an interesting tale. 101.2 Your father’s uncle is your grand uncle. Now if you said great uncle, you’re not wrong per se. In fact, legal decisions exist to the effect that the 2 phrases refer to the same thing…your parent’s uncle or your grandparent’s brother. Genealogy prefers “grand uncle” for this reason: once you start layering on “greats,” your direct ancestor and his brother will always have the same number of them. 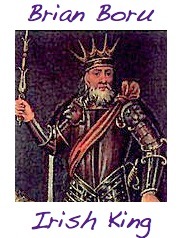 For example, your great great great great great grandfather’s brother is your great great great great great grand uncle. Each of them has 5 “greats,” commonly abbreviated as 5G. If you used “great uncle” rather than “grand uncle,” then the brother would be your great great great great great great uncle…6 greats…the same number of greats as his father, your 6G grandfather. Thus, the number of greats and the generations are off by one. 101.3 Using “grand uncle” keeps the number of greats in line with the generation. The way to best explain it is, you have no “great uncle” because you have no “great father.” What makes it even more confusing is the tendency of people who say “great uncle” to also say “grand nephew”…whoops! 101.4 Next…Your father’s 1st cousin is your 1st cousin once removed. Here “once removed” refers to your father’s generation…”twice removed” to your grandfather’s generation…”3 times removed” to your great grandfather’s generation, etc. We could very well be living in a culture where people understood “removed” as naturally as they understand “aunt/niece” or “brother/sister”…but we aren’t. And nobody but cousins are referred to as “removed”…for uncles and direct ancestors, the generations are indicated by “grand,” “great grand,” “great great grand” etc. We do it 2 different ways…it is what it is. 101.6 Wouldn’t it be better if we had something simpler to call your parent’s 1st cousin…like we do for your parents’ sibling, uncle/aunt? Of course. Instead we have the awkward “1st cousin once removed”…and as we’ve seen, this doesn’t indicate older or younger generation the way uncle/nephew does. This is a gaping hole in our system, plugged by genealogists by using “1st cousin once removed ascending,” what in Spanish is called “2nd uncle,” for the older…and “1st cousin once removed descending,” in Spanish “2nd nephew,” for the younger. Needless to say, it makes more sense in Spanish…but you know what? We soldier on in English, inconvenient terminology be damned. Yay for us. 101.7 Granted, you may have always called your 1st cousin’s son your 2nd cousin, but you were always wrong. It doesn’t do any good to argue about it…it’s a mistake, and if you want to play with the genealogical big boys, you have to stop making it. Forget about dictionaries…they report common usage even when it’s wrong….you must always take the dictionary with a smidgen of sodium chloride, unfortunately. 101.8 So who is a 2nd cousin? That’s the next answer…The son of your father’s 1st cousin is your 2nd cousin. And what I call “numbered cousins” go on the same way: the son of your father’s 2nd cousin is your 3rd cousin…which is to say, when a pair of 2nd cousins have kids, those kids are 3rd cousins to each other…the 2 kids being you, son of your father, and your 3rd cousin, son of your father’s 2nd cousin. The key here is that all-important concept of reciprocity: to your father’s 2nd cousin, your father is his 2nd cousin. Reciprocity is vital to keep from getting lost among the branches of the family tree. Trust me on this. 101.9 And thus the final answer is: The son of your father’s 1st cousin is your father’s 1st cousin once removed. 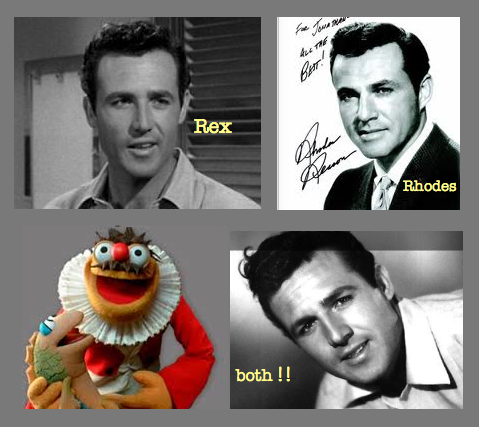 According to the diagram, Wes has the same relation to Adam…thru Andy…as Walt’s son would have to you…thru Walt. 101.11 quiz 2…Sneaky me…I took the fact that 1 wasn’t related to the other parents and changed it…making B and C the same person, namely Z. Now 1 and 2 are also half-siblings, along with 2+3 and 3+4….so X and Y are triple half-1st cousins, CR = 1/16 + 1/16 + 1/16 = 3/16. 101.12 quiz 3…This is the same diagram as quiz 1, but with 5 and 6 added to the great grandparents’ generation. As before, X and Y are double half-1st cousins (combined CR = 1/8) thru grandparents D, E, and F. Let’s look at what’s changed between A, B, and C. And you should notice another sneaky thing, altho I really didn’t mean it to be: A‘s mother and B‘s father are not shown, so we may assume they are “somebody else” and do not figure into the tag-team half-sibling arrangement. 101.13 So…simply take them one by each…A and C now have the same father 5 so they are half-siblings…1 and 2 are thus half-1st cousins. B and C have the same mother 6 so they are also half-siblings, thus 1 and 2 are half-1st cousins another way…making them double half-1st cousins. Their children X and Y are double half-2nd cousins, CR = 1/32…added to the 1/8 from double half-1st cousins = 5/32. 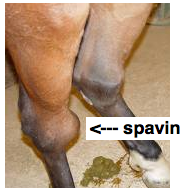 101.14 quiz 4…Look at this diagram carefully…then rub your eyes and look at quiz 2… keep rubbing as necessary. All that’s happened is that X and Y have traded parents and been moved around to keep you guessing…a shell-game added to the tag-team. 2 and 4 were the parents of Y, now they’re the parents of X and vice versa. But it’s the same relationship, triple half-1st cousins…and the same CR = 3/16.